Every Etz & Steel table is the culmination of years upon years of nature doing its job and us doing ours. We source our wood from lumberyards and salvaged tree yards all over the world, paying close attention to not only what materials we use, but where they come from. Primary construction of tabletops and woodwork is done in our small overseas craft shop. Some finishing and all steelwork and assembly is done locally in Los Angeles. At our shop, trees are milled into solid slabs of wood, which are then air-dried for a minimum of 3 months. The slabs undergo our propriety kiln and dry process for at least a month, to further control the humidity and ensure that the wood is suitable for lifelong use as furniture. We then cut and shape each slab, following the natural characteristics of the wood and using our experienced eye towards design. Once the basic shape of each product has been determined, the slabs are fused together using wood joints and non-toxic glue. "Butterflies" are carved and placed into joints to reinforce the areas where slabs intersect and cracks naturally form during the curing process. The joints both enhance the structural integrity of the wood and "tie a bow" aesthetically. 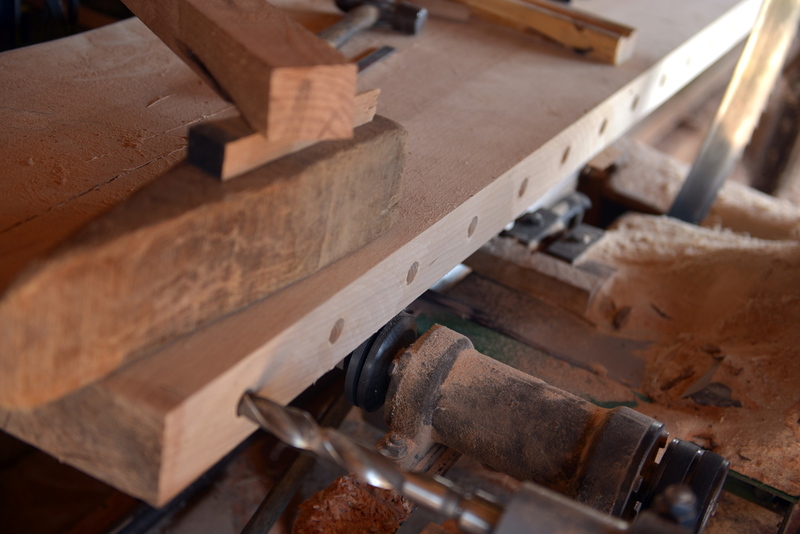 We finish some tables, notably White Oak and Ash designs, with their characteristic knots and burls, by wire-scraping and hand-brushing the surface. This labor-intensive process, performed by artisans with years of experience, augments the natural grain of the wood and leaves it with a popular "distressed" look and feel. These tables are then finished with WOCA Denmark natural oils, waxes, and resins. We sand and gloss our tables made out of Maple, Walnut, exotic and other species. The smooth finish leaves the surface with a beautiful, glossy sheen that frames the complex texture of the wood grain and colors underneath. For these species, we use Treffert coatings, which have earned international eco-label distinctions. Finally, like putting icing on the cake, our tables are supported by sturdy steel legs, made and finished here in Los Angeles. Our customization process allows you to order our sleek trapezoidal base in any color or chrome finish or we can work with you to create a custom base - in steel or wood. From conception to final product, each table in our existing collections may have taken a year or more until the final product was completed. Fortunately, we have geared up our manufacturing process over the past few years and carefully established a large assortment of cured slabs of solid wood. This allows us to support custom orders and projects within a standard 2-4 month lead time, depending on the size, species, and design.